West Chester, OH; September, 2017—Color-Logic Security-FX for digital presses, in addition to winning a MustSeeEms award at PRINT 17 in Chicago, was further designated Best of Category among Variable, Transactional and Multichannel entries in the competition. Said Mark Geeves, Color-Logic Director of Sales and Marketing, when accepting the award: "Color-Logic Security-FX for digital presses demonstrates how basic security features can be made available to brands of any size. We are pleased that the MustSeeEms judges recognized the value provided by our security features; we will demonstrate them to label printers at the upcoming Labelexpo Show in Brussels." West Chester, OH; September, 2017—Color-Logic--the leader in metallic color communication and decorative effects--is discussed as a primary security technique in the Second Edition of Introduction to Security Printing, by Richard Warner and Dr. Richard Adams. Referencing the new textbook, Mark Geeves, Color-Logic Director of Sales and Marketing, commented: " Warner and Adams are well known for their research in the security printing field, and t o have Color-Logic discussed at length in their book is both a privilege and an honor. The fact that Color-Logic effects and techniques are implemented at the design stage makes them affordable to anyone using digital presses with silver and CMYK inks, or white and CMYK inks on a reflective substrate." West Chester, OH; August 2017—Color-Logic--developer of the Process Metallic Color System--has received the coveted MUST SEE 'EMS award, in connection with PRINT 17, the international graphic arts exposition to be held in Chicago in September. 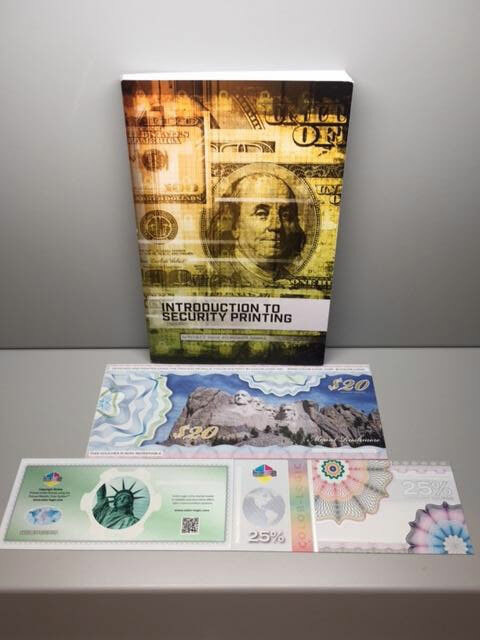 The award recognizes the security features licensed Color-Logic printers can offer their brand clients, in addition to the striking printed metallics produced on digital presses. Said Mark Geeves, Color-Logic Director of Sales and Marketing, in accepting the award: "Color-Logic Security-FX for digital presses is economical and enables virtually any brand to bring products to market faster while making them difficult to counterfeit. The Color-Logic Security-FX technology is executed at the design stage, which means it integrates well with the quick turnaround available when digital presses are used. See everything Color-Logic can do in PRINT 17 Booth 4813." Richard Ainge, Color-Logic Chief Technical Officer added: The Color-Logic security process incorporates dynamic special metallic effects that vary as the printed piece is moved. 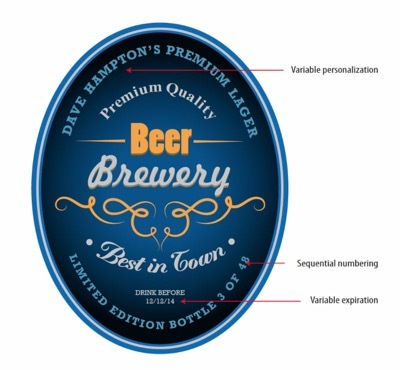 In addition, using the Color-Logic software, subtle watermarks can be embedded within metallic areas of a package design. These watermarks might, for example, be used to produce a subliminal logo branding effect in the label or package background. More advanced designers may use the Color-Logic software to create extremely complex security features such as colored and gradated metallic guilloches, or invisible ink separations generated from photographic images. Regardless of which available techniques are used, the Color-Logic system can add shine and security to product packaging that is limited only by the designer's creativity." West Chester, Ohio, USA; August 2017—At PRINT 17 in Chicago, Color-Logic--developer of the Process Metallic Color System--will show how printers can use conventional, digital, and hybrid printing presses to differentiate products for corporate and brand clients. "The world today is about brand," said Mark Geeves, Color-Logic Director of Sales and Marketing. Around the world, printers need strategies, technology, and marketing skills to help their brand clients differentiate themselves from competitors. In addition to demonstrating our easy-to-use software, at PRINT 17 Color-Logic will display physical samples showing what can be produced on the many and varied printing platforms we support." Richard Ainge, Color-Logic Chief Technical Officer, added: "Color-Logic works diligently to develop technology relationships with press and printer manufacturers, substrate (paper, plastic, and foil) producers, coating companies, and RIP manufacturers around the world. Thus we are able to provide printers and converters with the most economical solutions and the fastest return on investment. Color-Logic provides embellishments and decorative effects that add pizazz to print, decrease time to market, and are economical to design and produce. With Color-Logic, direct marketing, signage, packaging, labels, and tags can exhibit the same look across an entire brand campaign. Other decorative effects technologies support only one or two applications at most." Corporate clients and brands typically associate decorative effects in print with post-finishing techniques or the need for additional press units--either of which makes most decorative jobs expensive to produce. Color-Logic decorative effects are done at the design stage, which reduces manufacturing costs and time to market. Visit the Color-Logic booth at PRINT 17 to see the most economical ways of differentiating print. 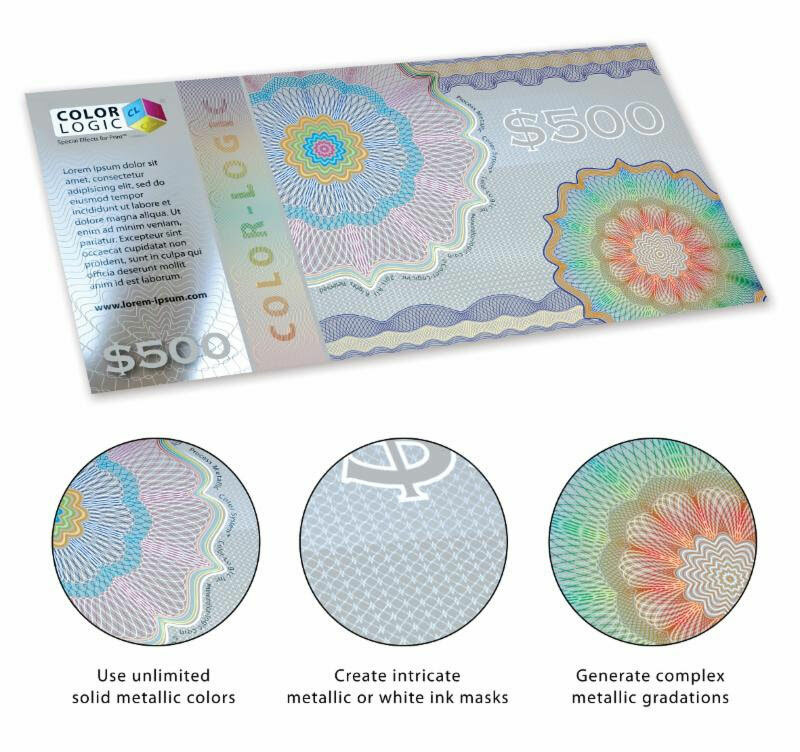 West Chester, Ohio, USA; May 2017—Color-Logic--the leader in metallic color communication and decorative effects--has released two new videos showing how designers can create anti-counterfeiting effects when using digital. Discussing the technique, Color-Logic Director of Sales and Marketing Mark Geeves commented: "The Color-Logic technology has always enabled brands to impart the WOW factor to their products, as well as provide brands with quicker time-to-market and more economical press runs. Now, Color-Logic enables brands of all sizes to implement a first level of security using white and CMYK ink sets on digital presses." Richard Ainge, Color-Logic CTO, added: "Color-Logic variable metallic data executed on a digital press can provide brands of all sizes with not only personalization, but a first level of anti-counterfeiting security as well. Color-Logic design tools, together with commonly used variable data tools like XMPie or HP Smart Stream Designer, easily provides brands with basic anti-counterfeiting features. 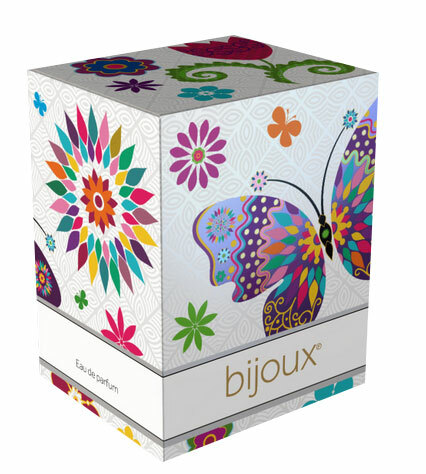 The Color-Logic system eliminates the need for white ink masks, so every label, carton, shrink sleeve, coupon, or other marketing piece printed on a reflective substrate can include variable metallic features." The two anti-counterfeiting videos are available on the Color-Logic website at www.color-logic.com/newspr/security, or may be requested at brands@color-logic.com.